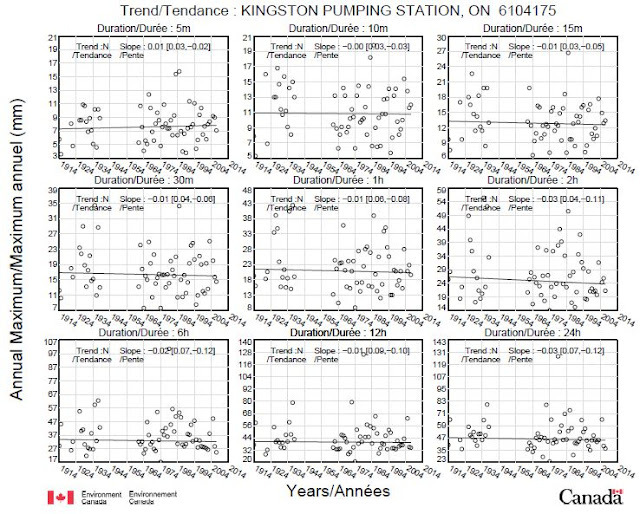 Environment and Climate Change Canada (ECCC) updates the Engineering Climate Datasets periodically including annual maximum series (AMS's) that reflect annual rainfall extremes over various durations, and also the derived rainfall statistics (intensity-duration-frequency (IDF) curves)) used in engineering design. Municipalities updating their design standards and practitioners involved in hydrotechnical studies can wait for official updates or complete them in-house. Raw data is available from Environment Canada for a small fee, and can be screened for data gaps / errors and then processed to identify the maximum rainfall each year over the standard periods of 5 minute to 24 hours. To review local design standards to account for any changes in rainfall intensity, my work team obtained raw data for the Pearson Airport and Toronto City (Bloor Street) climate stations in late 2017 to extend the ECCC analysis. The official Version 2.3 datasets extend to 2007 for Toronto City and 2013 for Pearson Airport - the added raw data extends to cover most of 2017 and 2016 respectively. After screening for anomalies, extended AMS's were analyzed using a Gumbel distribution to generate updated IDF curves. What do the charts show? Colleagues share that ECCC is updating the analysis for about 100 station records later the year. We'll see if there is any change in AMS trends and significance and derived IDF values compared to the current Version 2.3 Engineering Climate Datasets. A recent op ed in the Financial Post suggests that analysis of data up to 2012 is not sufficient to assess rain trends as the CBC/Radio-Canada Ombudsman Guy Gendron recently did. Based on the analysis here, adding a few more years to the record is not going to change the overall picture. Its best to focus on other factors affecting flood risk and not the past rainfall trends in regions like southern Ontario. What are some of these other factors? 5) Encroachment on overland flow paths, i.e., lost rivers in urban areas, putting properties at risk of pluvial flooding as this presentation analyzing flooding within overland flow path areas in Toronto in the May 200, August 2005 and July 2013 storms. Detailed spatial analysis shows that most basement flooding can be explained by 2 factors of i) sanitary sewer inflow and infiltration rates (normalized for catchment area and design return period in a calibrated hydrodynamic model), and ii) the percent full of the sanitary sewers during extreme events - these 2 factors numerically explain over 60% of insurance back-up risks at a postal-code scale of accuracy. What does this mean? Municipalities need to i) reduce extraneous flows in a cost effective manner in the short term, ii) upgrade sanitary sewer capacity where residual flows are high compared to capacity, iii) upgrade critical storm sewers where design standards are limited and overland flooding stresses adversely affect properties (pluvial flooding at the surface, inflow stresses below the surface), iv) offer private property isolation subsidies (backwater valves and foundation drain disconnection) to provide timely cost-effective risk reduction. What to do where? It all starts with risk screening, as illustrated in our previous post describing tiered screening for riverine, sanitary and storm systems risks prepared for the Intact Centre on Climate Adaptation for their existing communities 'best practices' document, and another post describing such tiered screening with quantified risk factors prepared for Green Communities Canada's Urban Flooding Collective project. What about a city-wide perspective on how much to budget for a comprehensive program of flood risk reduction incorporating these tactics? See a recent post that explored the cost-effectiveness of various municipal-wide strategies - look for more details at the 2019 WEAO Annual Conference, and look for even more in future national standards on benefit/cost analysis for flood mitigation we are developing for the National Research Council.